David @ 360 Degree Fitness: Are you drinking your calories? One of the first things that I have clients do when they start with me and are keen to lose weight is complete a food diary for around a week. This accomplishes a couple of different things. Firstly, it shows me what their commitment level is like - keeping a food diary may be a bit of a pain to do, but it isn't that taxing in reality. It takes a few minutes per meal. If it is too much hassle to do this, how ready are they to adjust their lifestyle and keep working on it when things get tough? That may sound a little pessimistic but I have found a pretty good correlation between the two. Motivation plays a huge role in lifestyle change. Next, it makes people more mindful about what they are consuming. I make a point of asking them not to alter their eating. It's not about judging them, it's simply a snapshot of where they are starting from. Somewhere to begin, and something that shows me where we could make simple changes that could greatly impact them in the long-term. One thing that surprises people when they look back through their diary is how many calories they are drinking per day. Many clients work in an office, which to be honest is pretty common for the population as a whole. Often this comes with meetings, morning and afternoon coffees often included, lunches in cafes with friends or coworkers, and after work drinks on Fridays. One thing to consider if you are trying to lose weight is the amount of calories in those coffees and after work drinks. Especially if those coffees are hot chocolates or mochas. According to the food diary app that I use (Easy Diet Diary), a regular flat white of 275ml (just over a regulation cup) is 637 kilojoules (kilojoules are just a different energy measurement to calories). Now considering that I have a daily intake of around 8500kj, that makes that coffee about 7.5% of my daily food intake, which is a fairly large amount when you think about it. And that is just a flat white, the numbers go even higher for hot chocolates and mochas. Multiply that number if you have a couple of coffees a day and that is 15%. Take into account if you drink anything other than water or calorie free soft drinks with your lunch or at your desk and the numbers start to add up quickly. Alcohol is the same. Take red wine - generally considered one of the better alcoholic drinks for you (if you can really say that). A 150ml glass of red wine is around 480kj or 5.5% of my available food intake for the day. Add a couple of those after work each Friday, add those to your twice daily coffee and that's around 10,000kj, or about 17% of my weekly food intake. Now I know that I've thrown a lot of numbers around here. I'm not trying to confuse you. But just get you to think a little more deeply about how you are apportioning your calories. Many people drink coffee out of habit - I know that I definitely do. Plus you can't really beat that first morning coffee in my opinion! 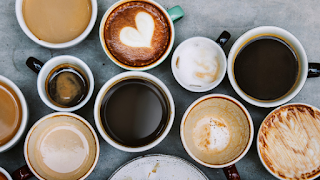 I am not saying not to drink coffee at all, or to abstain completely from drinking alcohol, but look at possible ways to modify your habits to help you achieve your goals. One thing that I have started doing recently is to swap my morning coffee to a long black with a splash of cold trim milk. This drops my morning coffee from 637kj down to 73kj. That's a huge drop in the amount of kilojoules I am having. The same can be done with alcohol. If you usually have spirits mixed with soft drinks (bourbon and coke for example), check and see if the bar has sugar free or low calorie soft drinks and get them mixed with your favourite spirit. Or even go to soda water for even less calories. Again, I am not saying drop these things out of your diet completely - you can try if you want, but I have found that simple changes work well enough if we think about what we are doing and consciously make better decisions. It's just a matter experimenting until you find out what works best for you. I'd love to know what tips you have that have worked for you in terms of substituting healthier options into your diet. Let me know through my website.